FlashForge Creator Pro Review: This is an affordable 3D printer that didn’t give us too many difficulties. The setup process may take a bit long but the quality of prints and reliability are worth it. Check it on Amazon. The latest 3D printer by Flashforge is slowly but surely becoming one of the must-have 3D printers in the industry. The Creator Pro has received many updates and improvements compared to the original Creator model. Flashforge placed a Dual Extruder on the Creator Pro FFF printer. You’ll get a heated build plate on the Creator Pro and an enclosed environment. This means that you should be able to print almost any material. Your support structures can be dissolvable because you are using a dual extrusion printer. In fact, you can print more complicated designs with this printer than some of its rivals that have a single extruder. The previous 3D printers produced by Flashforge have a wooden construction while the latest Creator Pro has a steel construction. Steel makes the printer more sturdy and appealing. It also further contributes to the precision of your 3D model. The reduction in vibrations on the machine enables it to provide its very best. The printer has an upgraded build plate of 6.3mm aerospace grade aluminum. With a build plate as thick as this one, there is very little chance of your models deforming after the various heating and cooling cycles. You’ll get a better result because of the plate thickness and its ability to keep heat longer even if temperatures in its immediate environment change quickly. Even though the build plate can retain heat for longer, it can withstand the high temperatures required to print blended or exotic filaments. The Flashforge Creator Pro printer’s enclosed design offers the perfect environment for printing your 3D models. Your prints will be protected to room and humidity changes that may affect the final outcome. ABS is one of those fragile filaments that is printed best at environment temperature. If there are slight changes in the temperature, you will notice deformations in your ABS model. 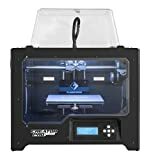 You should use the Flashforge 3D printer in an area with good ventilation. A material like PLA needs to cool off as soon as possible after it is extruded and will, therefore, benefit from the internal ventilation system. The resulting models will not only be more accurate but also smoother. Removing the Creator Pro’s build plate is as easy as opening the front side of the printer and taking it out. The ability to open the whole front sides makes everything easy, even for a novice. The unboxing process is somehow confusing if you compare it to the well-packaged printer like Dremel’s 3D40 printer. To begin, most of Creator Pro’s objects that belong together are wrapped separately. Secondly, the instructions in the box are not clear. Eventually, you’ll get the job done but not without having to read some sentences two or three times just to check that you’re on the right track. The single boxes included in the packaging are not labeled. Therefore, it is hard to figure out the next pieces of the puzzle that you’re looking for. US residents are required to set the power supply’s voltage to 110 volts. You’ll have to open the printer to access the power supply inside to change it. Although this is not a difficult process to complete, you’ll find it a little strange. This shows that this printer is ideal for people that enjoy extensive setups rather than most average home users. If you got so far, then you are over the most challenging steps. Everything from here onwards is quite easy to do. One of the tasks involves screwing the extruders into place. After that, you’ll also have to screw the top acrylic cover and the front door of the printer. You can now go ahead and add filament to the two spools. Before you start to print, keep in mind that the build plate has to be level to achieve optimal results. Adjusting the build plate should not take you longer than 30 seconds to complete. The 2016 Creator Pro model was the first to bring FlashForge’s own slicer software to consumers. Unfortunately, you won’t have access to it but would have to install the ReplicatorG software, which is outdated at the moment. You can use FlashPrint as a substitute software and it will do more than get the job done. When starting out, you can choose from 4 different standard profiles. Choosing any of the profiles will give you excellent results without having to do any tweaking. After the software is confident that you know what you’re doing, it will open up the advanced settings. In the advanced settings, you can change the print speed and the type of filling you would like for your model. Instead of printing the regular G-code, you will need X3G files to complete prints. Although this is a limitation of the software, there is a way around it. A simple solution to this potential problem would be to export your files as X3G instead of G-code. Most of the popular software such as Simplify3D don’t have a problem with doing this. After finishing your design in your preferred slicer software, it is time to export it as an X3G file and load it on to an SD card to print. This process is a bit outdated but will save you a lot of time compared to using a Wi-Fi connection instead. To help your first layer stick better, Flashforge includes 3M blue tape with the printer. Pressing a few buttons here and there will get your print to start. The noise level of Flashforge 3D printer is rather low. The reduction in sound is mainly due to the sturdy build of the chassis and full enclosure. You will certainly hear the motors when you use both extruders but this should not bother you too much if you listen to the overall sound produced by the printer. Sometimes, the printer door vibrates during the printing process. However, you can prevent the vibration by placing some felt pad into the opening. When you turn on ABS or PLA material setting on the printer, it getting a failed build becomes even rarer. This is because the printer is fully enclosed and its build plate can retain heat for longer periods of time. Even though the FlashForge’s default settings give some good results, you can play around with some of the advanced settings. Instead of trying to print a complicated model the first time, do a test model to see if the settings work fine for what you really want to print. The Creator Pro 3D printer has an excellent reputation. When you purchase the printer, you will be joining a fantastic community with solutions to possible problems you might run into. Besides visiting the online community of Flashforge, you can get some tutorials and tips from anywhere on the internet. YouTube has a lot of how-to videos if you are new to using the Creator Pro 3D printer. A warranty is the last thing you need to be concerned about when you want to improve and upgrade your printer. The open source nature of this printer allows you to do as much customization and improvements as you wish. US consumers benefit even more when they purchase their printer from Amazon because the company includes the legendary “Tang” customer service that has helped Flashforge build their reputation. You don’t have to be worried about getting left behind in 3D technology when you choose FlashForge’s printer. The company’s history speaks volumes about their dedication. For example, at one time the company gave out free replacements to their customers. Just hop on to Amazon if you need proof of their customer satisfaction. You may find the on and off switch to be in a rather awkward position, depending on where you place the printer. Also, the printer’s setup instructions are not thorough and easy-to-understand. However, you will still be able to set up the printer. The best way to get things done faster is to hop on the internet and go through some online tutorials. Finally, you won’t be able to use some of the most common filaments in this printer, apart from those specified. This doesn’t mean you can’t have fun with the recommended filaments. The Creator Pro truly gives you value for money. The printer produces high quality and reliable models. The dual extrusion feature of the printer allows you to print even more filaments that you normally would with a single extruder. All and all this is a great machine. Formlabs Form 2 Review: Is This The Best SLA 3D Printer?